The Chapel of Bones in Évora, Portugal, is part of the larger Royal Church of St. Francis, and was constructed by Franciscan monks in the late 16th century. The Chapel's story is a familiar one. By the 16th century, there were as many as 43 cemeteries in and around Évora that were taking up valuable land. Not wanting to condemn the souls of the people buried there, the monks decided to build the Chapel and relocate the bones. However, rather than interring the bones behind closed doors, the monks, who were concerned about society's values at the time, thought it best to put them on display. They thought this would provide Évora, a town noted for its wealth in the early 1600s, with a helpful place to meditate on the transience of material things in the undeniable presence of death. This is made clear by the thought-provoking message above the chapel door: "Nós ossos que aqui estamos, pelos vossos esperamos," or: "We bones, are here, waiting for yours." 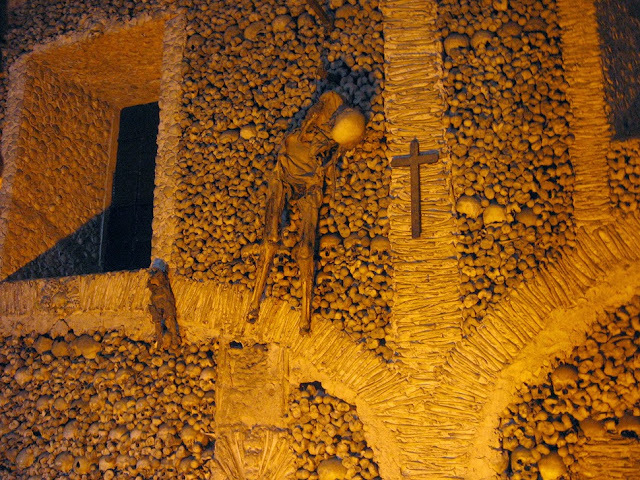 The design of the Chapel of Bones in Evora is based on the ossuary of San Bernadino alla Ossa in Milan, Italy. 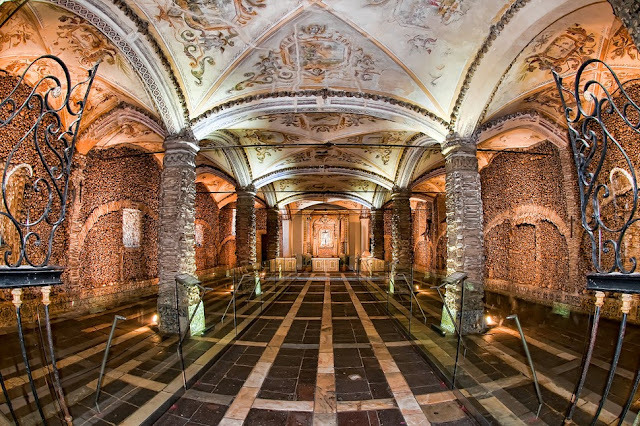 The immediate view as you enter the Chapel gives you some idea of its scale and the sheer number of bodies that are interred here — some 5,000 corpses. Among them, in a small white coffin by the altar, are the bones of the three Franciscan monks who founded the church in the 13th century. Also included are two desiccated corpses hanging by chains from the wall next to a cross. One is that of a child. The purpose of the Chapel is made clear by a poem (translated below by Rev. Carlos A. Martins), written by Father Antonio da Ascencao, that hangs from one pillars: "Where are you going in such a hurry traveler? Pause... do not advance your travel; You have no greater concern Than this one: that on which you focus your sight. Recall how many have passed from this world, Reflect on your similar end, There is good reason to reflect If only all did the same. Ponder, you so influenced by fate, Among all the many concerns of the world, So little do you reflect on death; If by chance you glance at this place, Stop... for the sake of your journey, The more you pause, the further on your journey you will be." Just in case all that death should cause you to despair, at the end of the Chapel, above the altar, you can read the Latin phrases: "I die in the light" and "The day that I die is better than the day that I was born."